Assistance is needed on all sections of the two NYSBS-Sponsored trails. 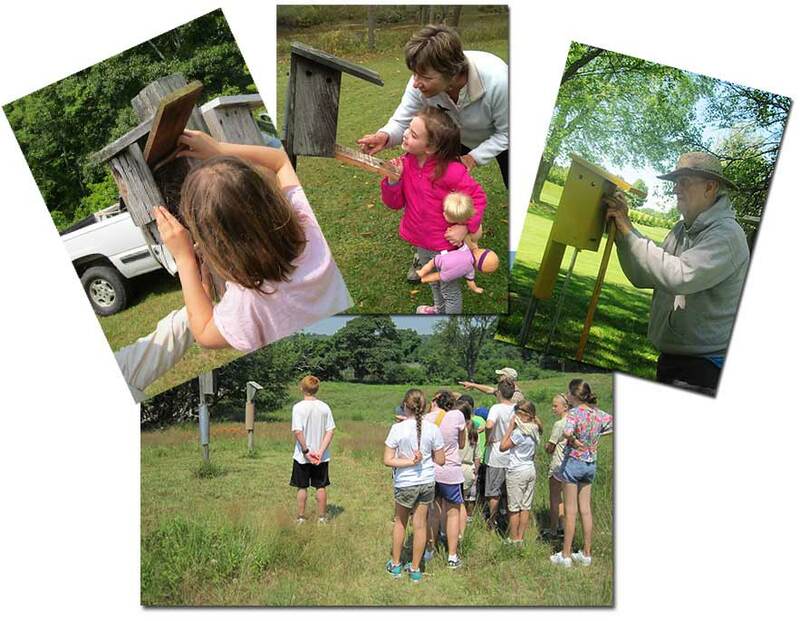 Bluebird Trail monitoring is fun for kids of all ages! The New York State Bluebird Society has a volunteer State Coordinator(SC)/Area Coordinator(AC)/County Coordinator(CC)/Bluebird Ambassador(BA) program. The Area Coordinators, under the direction of the State Coordinator, oversee the CC’s and BA’s in their assigned area of the state. This is an on-going program. The original volunteers were recruited in early 1996 and the Coordinator Committee, with Jim Kunz as chairman, began its work in the Summer of 1996. It was expanded in 2007, with Judy Derry as State Coordinator. The program has been successful as it provided local contacts for information on the conservation of bluebirds and other cavity-nesting birds. The goal of the SC/AC/CC/BA program is to strengthen our conservation efforts where there are County Coordinators and Bluebird Ambassadors and expand our membership in every county of New York State. The keys to this objective are providing our members and potential members with information, education, training and nest box suppliers. Every SC/AC/CC/BA has been loaned a NYSBS Handbook that provides the program members with basic information on Eastern Bluebirds, along with the history of the organization, a contact listing, articles on How to Write a News Article, Sample News Releases, forms and handouts along with other resources for programs. The Handbook can help the AC/CC or BA answer questions along with promoting membership in the NYSBS. In order to become a SC/AC/CC or BA, you need to be a member of NYSBS. New volunteers are given the resources necessary to assist in educating others about bluebirds (and other cavity nesters). By educating people outside the organization about bluebirds through programs and memberships, we hope to expand the membership in NYSBS, and with that, the resources to help others interested in bluebirds and other cavity nesters. The SC/AC/CC/BA volunteers are supported by the NYSBS’s Officers, Board Members, Committee Chairmen and the Speakers’ Bureau. A brief description of each position follows. The State Coordinator provides leadership and management of the entire Area Coordinator, County Coordinator, and Bluebird Ambassador Program. He/She is a person who has knowledge and enthusiasm about bluebirds and other cavity nesters and is willing to promote programs and develop quality information to support those programs. The Area Coordinator is the NYSBS person responsible for a block of counties making up one of ten areas in NYS. He/She is a person who has knowledge of and enthusiasm for bluebirds and other cavity nesters and is willing to promote and share quality information furnished by the NYSBS. He/she acts as an advisor to the County Coordinators and Bluebird Ambassadors in the volunteer’s area. 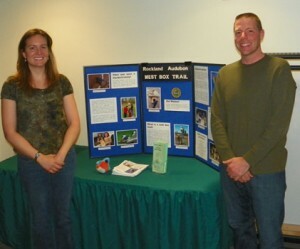 They are mainly responsible for recruiting new BAs and CCs and overseeing their training as representatives of NYSBS. The County Coordinator position, under the direction of the Area Coordinator, or if none acting, under the direction of the SC, provides leadership for programs and activities of the NYSBS in their assigned county. The CC is the primary source of information about the Eastern Bluebird for many people in NYS. He/She is a person who has knowledge and enthusiasm about bluebirds and other cavity nesters and is willing to promote and share quality information furnished by the NYSBS. The County Coordinator is the representative of NYSBS in the assigned county. The Bluebird Ambassador (BA) is a source of information about the Eastern Bluebird for people in local neighborhoods. He/She is a person who has knowledge and enthusiasm about bluebirds and other cavity nesters and is willing to promote and share quality information furnished by the NYSBS. The Bluebird Ambassador is a source of local information and support for the County Coordinator; they represent NYSBS in the many neighborhoods throughout NYS. The Bluebird Ambassador position is overseen by the County Coordinator. At the discretion of the CC, there may be one or more BAs in a county. All positions require membership in NYSBS.
. If they cannot answer your question, they will find someone who can. Volunteers manning a Bluebird exhibit. Photo by John Ruska. , and include your name, contact information, and the county or area you live in.